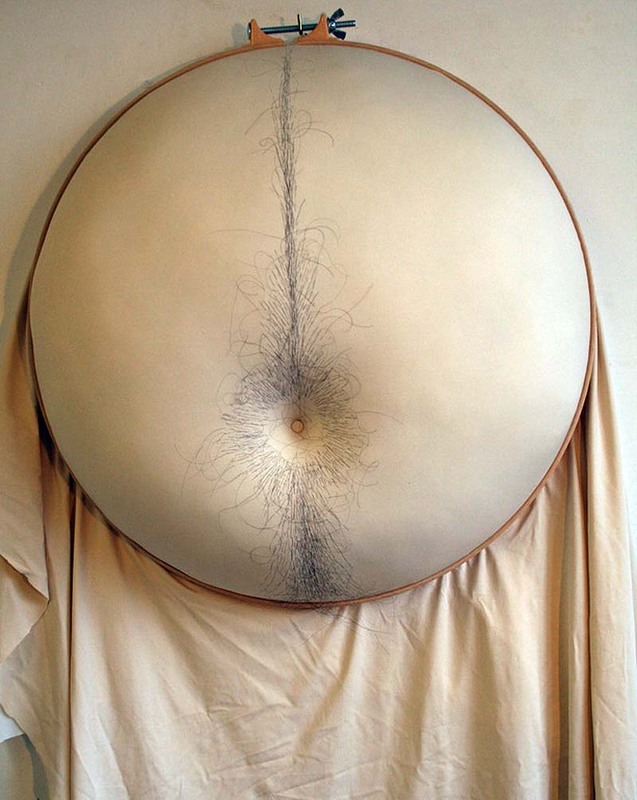 These sculptural embroidered works by British artist Sally Hewett are intriguing, if a tad disturbing. But that’s just her point. Hewett is interested in the social and political history of the craft of embroidery and stitching, but she is also interested in the ideas of beauty. She writes on her website: “My embroidery and stitching practice centres on bodies, beauty and ugliness and the conventions that determine which is seen as which…I am interested in how we see things, how we interpret what we see and how the connotations of needlework and embroidery as a medium affect how the content is seen – is it seen as ugly, beautiful or funny?” You decide. These pieces are made using quilting hoops that vary in diameter from just a couple of inches up to almost 20″. Inserted in the hoops to create the large bellies, bottoms, breasts, lips and more, is everything from stretched velvet, lycra, or cotton, to foam padding, hair and, of course, stitching…lots of stitching. Photos courtesy of the artist; bottom photo by Jane Burns. This entry was posted in Art, Fun, Pop Culture. Bookmark the permalink. I just discovered your blog through this post. I love Sally Hewitt’s work, and I can tell just by browsing that I have hours of looking ahead of me. It is so nice to have found an in to the NYC art scene that I can review from the midwest. I’m looking forward to more!